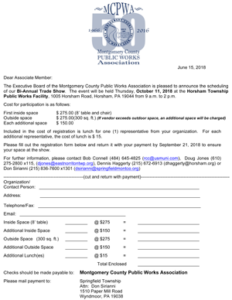 MCPWA – Montgomery County Public Works Assoc. The Montgomery County Public Works Association assists in providing educational training for member municipal workers to better and more safely serve their communities. Public Works improves public roads with services that include paving, pothole patching, street light, traffic signal, sidewalk, curb and gutter installation and repairs as well as maintenance tasks such as street sweeping and snow removal. 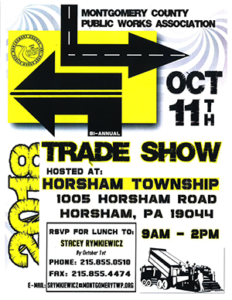 The Montgomery County Public Works Association promotes the advancement of public works services by sharing of information and experience to improve practices and find solutions through exchanges with other professionals. Public Works maintains the water, sewer, stormwater and other municipal utilities infrastructures as well as sanitation services and recycling programs. The Montgomery County Public Works Association awards scholarships to students who attend a trade school or accredited college program with the intent to pursue a career in the public works field. The MCPWA also recognizes current professionals for their contributions and achievements in the field of Public Works. During severe winter storms, floods, windstorms, hurricanes, or other emergency situations, Public Works, operating in coordination with other first responders, moves to quickly and effectively restore safe streets and environmental conditions. For 50 years, the Montgomery County Public Works Association has strived to advance public works services in southeastern Pennsylvania through education, training and shared expertise. Compromised of municipal professionals and private sector sponsors, the MCPWA seeks to improve practices in the public works field with the latest technologies and standards. 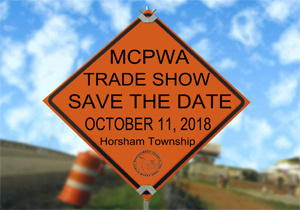 LAST CALL for MCPWA Trade Show Exhibitors!